Most of the cooking and baking recipes I know are “Calabrese” in style. 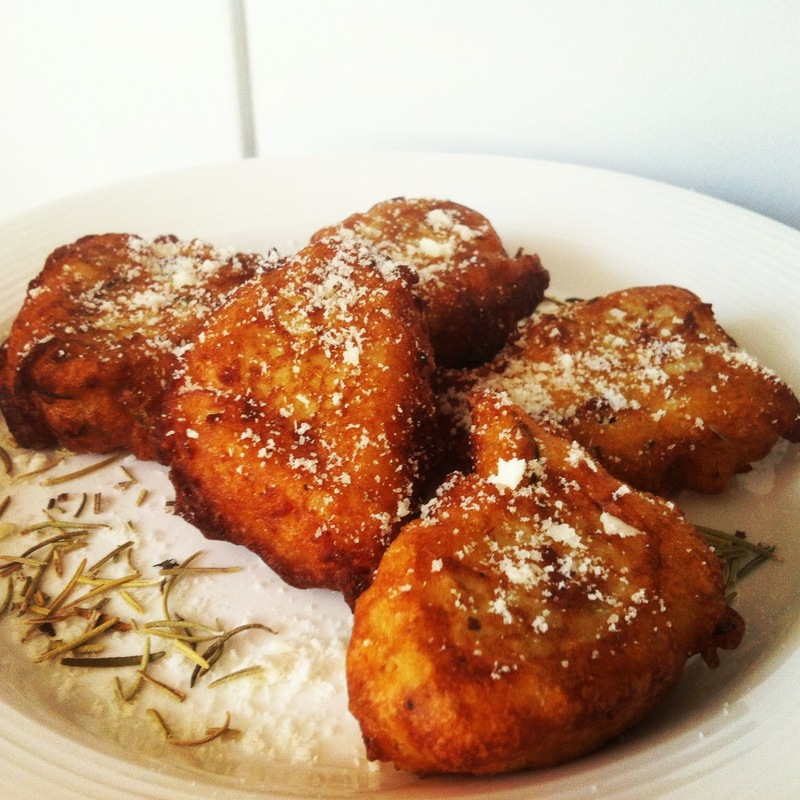 Certain foods, like stuffed eggplants, zucchini flower fritters, and zeppole, aren’t made all the time, but often enough that the flavors are familiar and eating them is nostalgic. Not to mention, they are all fried and insanely delicious. One of my favorites is ‘pitei di patate’ – essentially Calabrese potato pancakes or fritters (pronounced ‘pee-tay-ee dee pah-tah-te). Everyone in my family has their own ‘style’ which is typically just ‘plain flavor’ and for being plain, they are freaking awesome. If you know me, you know I like to get crazy, so here’s my savory take on a classic family tradition using leftover Rosemary Garlic and Parmiggiano Mashed Potatoes. Beat the egg and add to the mashed potatoes, along with the flour, cheese, milk, and baking soda. Since the potatoes are already seasoned, no need to add salt (but if you make fresh, I would add about 1/2 tsp. of salt). In a large frying pan filled with about an inch of canola or vegetable oil, heat over medium high until a droplet of the batter sizzles and dances. Now you’re ready to start frying. Using a tablespoon, drop generous and consistent amounts of the batter into the oil. Cook each side for about 3 minutes, and do not flip them until browned. Remove and place on a paper towel to absorb any excess oil. Serve immediately (but careful, they are HOT) – and sprinkle with grated Parmiggiano Reggiano for an extra kick. Buon Apetito! I have always wanted to do “something” with leftover mashed potatoes! This looks so good. I love how you served them with rosemary garlic mashed potatoes! Carlo, I made these this morning and we loved them! I finally made mashed potatoes last night and had a mountain of leftovers and I’m so glad because I finally had the opportunity to try these. Delicious! Thank you for your recipe!